“When Linden Lab finally get round to releasing Experience Permissions i am gonna be SOOO ready.” Thats what i said on my rez day last year. Turns out i was far to busy with other projects when Linden Lab finally announced the Experience Tools Beta. 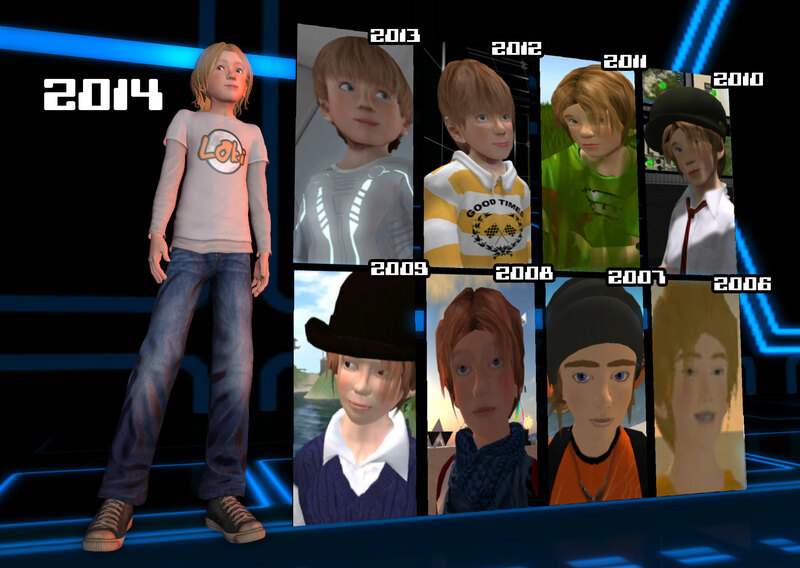 I’ve reached NINE years, almost a decade of my life shared with virtual world existence. Still no sign of any cake from the Lab, i guess they really don’t do that anymore. I don’t mind since the Lab seems to have been very busy after the Ebbe liberation. So as usual I’ve added to the ever growing faces of Loki over the years. This was the year i finally set to task at creating a replacement mesh body. Ever since mesh was introduced to Second Life people have been asking me when i would make a mesh body. Well now i have and it’s allowing me more freedom to craft great looking clothes much quicker. I also did some new experiments with hair this year and am actually a tad shorter in response to everyone wanting to be a more accurate size. This is the most i have ever messed around with my avatars shape and while the body is now meshed up to the neck my avatars head remains the same head i’ve always had and still uses the default SL male avatar mesh. I also replaced my ears with mesh ears, not that you will notice under those surfer locks. Congrats on hitting nine years, and here’s to the next nine, wherever they may lead us!